Welcome to Louise Jane web site! Come give it a go at Dover, fishing with Andy King and his son James running the purpose bulit angling boat Louise Jane out from the port of Dover. Louise Jane is 36ft and has very large deck area ideal for fishing from. 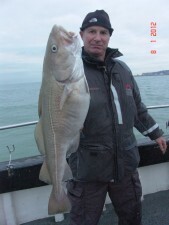 20 YEARS OF BOAT FISHING EXPERIENCE AS SKIPPER FISHING FROM FOLKESTONE AND DOVER GIVES YOU THE THE BEST CHANCE TO ENJOY YOUR DAY OUT AND CATCH FISH. From October to March the Cod move inshore off of Dover and the inshore marks. We offer two lengths of trips, either an 8 hour or 10 hour trip depending what you would like.